The recent death of a child on a school bus in the city of Dongducheon in Gyeonggi Province has highlighted the urgent need for practical measures to be put in place in order to prevent similar accidents from happening again. This follows the death of a four-year-old girl who had been left unsupervised in a heated school bus for several hours. Inevitably, the parents and members of the public have expressed outrage at such news of what could have been an avoidable death. The specialists continuously claim that this accident was caused due to the carelessness of the preschool teachers and the bus driver. The government has made it mandatory to install a ‘Sleeping Child Checking Device’ in all school buses in response to the growing uproar. However, non-governmental organizations have criticized that this plan is not only unrealistic, but also cannot be a fundamental solution for accidents of this type. A principal of a preschool in Dobong-gu claimed that the government should be focusing on improving the general preschool environment rather than installing the ‘Sleeping Child Checking Device’. She continued to say, “In the United States, the qualification of being a school bus driver requires a written and an emergency handling examination as well as other necessary training. 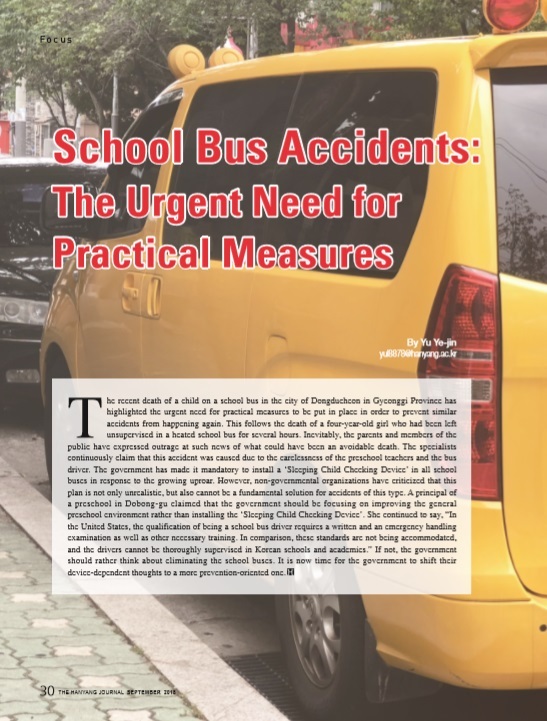 In comparison, these standards are not being accommodated, and the drivers cannot be thoroughly supervised in Korean schools and academies.” If not, the government should rather think about eliminating the school buses. It is now time for the government to shift their device-dependent thoughts to a more prevention-oriented one.